Usec. Egco, the Filipino People shall not allow the Presidential Task Force on Media Security to become a tool of the Media Cartel. The PTFoMS press release [TP: PTFoMS statement] essentially parroted the National Union of Journalists of the Philippines’ hyper-partisan statement of condemnation against ThinkingPinoy, a statement that the latter has conclusively addressed in a June 20 ThinkingPinoy article “TP: NUJP’s Condemnation: Jes Aznar, Marawi Siege, and Matobato”. What the hell is Big Media talking about? Nobody said there’s a warrant against Aznar. Big Media essentially created a demon by misrepresenting my statements, which was that the Armed Forces has the option to arrest Aznar for endangering our troops in Marawi. It’s one thing to say that the AFP has the option, and it’s a totally different thing to say that the AFP will indeed exercise it. The problem, however, is that PR-operators-turned-journalists, such as Bubby Dacer protégé Inday Espina-Varona [FB: Varona], echoed this imaginary accusation as if it’s some Bible Truth. To make matters worse, PTFoMS Usec. 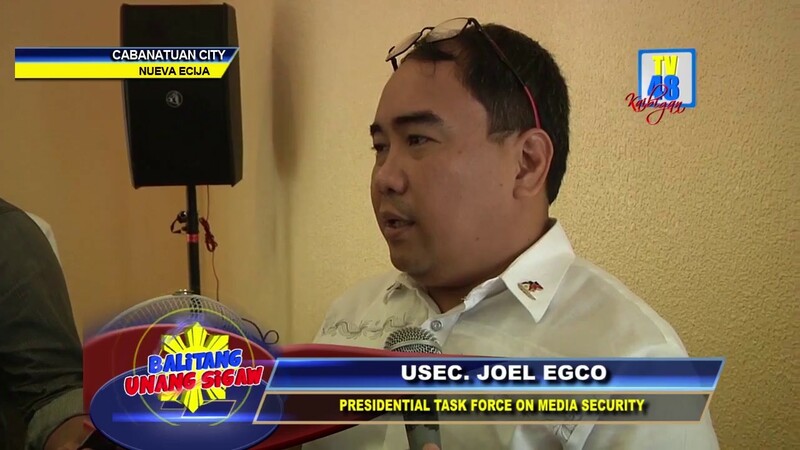 Joel Egco, a presidential appointee and former president of the National Press Club [MT], allowed himself to be used as the exorcist of this imaginary demon, as I pointed this out in a strongly-worded June 22 statement addressed to Usec. Egco [TP: Egco]. The PTFoMS essentially allowed itself to be used by Big Media to forward its desperate agenda of de-legitimizing independent social media publishers like me, at a time when Big Media companies continue to lose influence as their social media engagement figures continue to dwindle [TP: Media Wars; Facebook Insights]. Published using the agency’s official letterhead, the PTFoMS statement is curiously unsigned, which is uncharacteristic of official press statements from the government. There’s something fishy going on. The Presidential Task Force on Media Security exists by virtue of President Rodrigo Duterte’s Administrative Order No. 1, entitled “Creating the Presidential Task Force on Violations of the Right to Life, Liberty and Security of the Members of the Media” [GovPH]. SECTION 5. The Presidential Task Force Spokesperson. The Secretary of the PCOO alone shall be authorized to make public statements on matters concerning the activities of the Presidential Task Force. Unless otherwise ordered by the Secretary of the PCOO, the Executive Director may also make public pronouncements but only on matters related to the administrative functions of the Presidential Task Force. A.O. 1 Sec. 5 categorically states that PCOO Secretary Martin Andanar ALONE is allowed by law to issue public statements, save for administrative functions. However, the June 22 PTFoMS press statement is not about an administrative function. The problem, however, is that it is not in Sec. Andanar’s character to issue such kinds of statements, so it appears that somebody may have usurped the PCOO secretary’s authority. Situations like these are precisely the reason why AO 1 Sec. 5 exists. Every press statement that the PCOO releases goes through a meticulous vetting and approval process to make sure that it is in consonance with the directives of the President. However, it appears that one or a few overeager people inside PTFoMS wants to take over Andanar’s responsibilities, something that is not only unethical, but also illegal. The bigger problem? AO 1, plus the statement’s styling, makes it appear that it was Andanar who issued the statement, which is NOT the case. Alright, it’s time to contact Egco. I contacted Usec. Egco to clarify the matter. Present in the conversation was a social media officer (SMO) of the PCOO, so if Egco disputes any of the following quotes, that SMO can confirm if they're true or simply made up. Egco: Two nights ago, dinala ng NUJP sa Task Force ‘yung tungkol kay Aznar. Finorward ko kay (PCOO Asec) yung complaint ng NUJP… talagang ire-raise nila. You know what I did? Ayan, nakikita ni (SMO) ha? Sabi ko kay (PCOO Asec), puwede nating gawin is hindi tamaan si TP. I reminded Usec. Egco of AO 1 Sec 5 then said that any statement from the Task Force shall be construed as coming from Sec. Andanar. TP: Let’s not kid ourselves. Hindi man ako pinangalan dito, ako pinatatamaan nito. At ngayong binasa ng readers ko ang statement, alam nilang ako ‘yon. So ang tanong lang po, sir, inallow ba kayo ni Secretary Andanar na i-publish ito? Egco: RJ, I’d like to clarify. Eto ha… please believe me and you can verify from sources… not a single period, not a single dot (in the statement was from me). TP: So let me ask you sir. You consulted with NPC, NUJP, lahat na ‘yon. Why did you not consult me? Egco: It was a meeting. Noong pinag-uusapan yung kay Aznar, I was outside. Noong pumasok ako, sabi ko, ‘Ano na ‘yung agenda?’… It was not my decision. TP: So whose decision was it to publish the statement? Egco: It was the decision of the entire body, RJ… You have to be there in the meeting to (fully appreciate the facts)… There’s an urgency, according to them. TP: Then why didn’t you call me? I’m awake 19 hours a day. TP: Eh sir, you cannot say that I should just trust you. Let’s talk professionally here… What’s clear here is that... it was referring to the issue that I have with NUJP. My article two days ago reached one million hits. (Practically) the entire Philippines knows about it. Egco: Actually, ako mismo, hindi ko nakita ang post ni Aznar, hindi ko nakita ‘yung banatan niyo o yung ah… reaction mo ‘don. Believe me, hindi. TP: So why did you allow this to be published e wala pala sa inyo lahat ng info? I begged to differ, and I started reading to him the PTFoMS press statement, then he interjected. Egco: Sabi nila (the press), there are memes with a picture daw ni Jes Aznar at nakalagay “Maute Supporter” coming from many… mga ganon... kako hindi ko nakikita but kung ganoong kadelikado… If he needs police protection, I’ll provide it. I searched both [Twitter] and [Facebook] for such memes. NONE WENT VIRAL. Yes, the PTFoMS essentially condemned social media even if the evidence is imaginary. 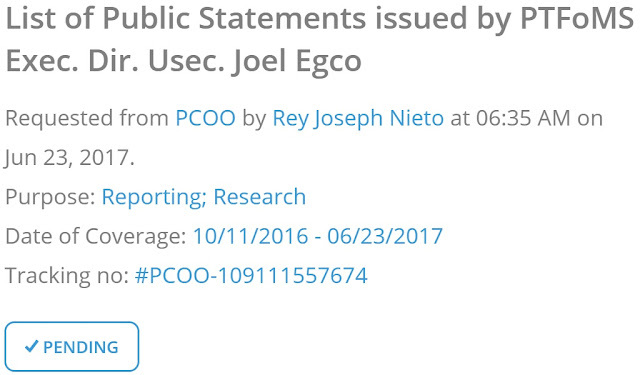 Egco: Sabi nila, ‘Hindi, yung mga threats ng mga… oo e… nung mga netizens, no? Not you! In fact, hindi binanggit ang pangalan mo. Yung mga netizens grabe na… The one who was doing all the talking yesterday was Joe Torres… yung representative ng NPC. At this point, it appears to me that the mainstream journalists are actually commandeering the PTFoMS meeting, in violation of AO 1 Sec 2, which states that the media organizations serve only as resource persons and observers. TP: Noong naglabas kayo ng press statement, ang template na ginamit ninyo, nakalagay, Chairman Aguirre, Co-chairman Andanar, Executive Director ikaw po… Hindi po rito sinasabi na ang nagsulat pala nito ay ‘yung mga journalists na yan. Pag nilabas itong statement na ito sir, pangalan ninyo, ni Andanar, at ni Aguirre ang nakasalpak dito. Egco: Ah, hindi kasi, iyan yung official letterhead ng Task Force… May imprimatur ‘yan ng Task Force, not me. TP: Eto sir, categorical na lang po. Correct me if I’m wrong. Yes or no lang po. Did Martin allow this? TP: So Sec. Martin is out of this? Egco: Yes, yes, yes. He is, he is, he is (out of this). Thus, it’s as clear as day that the PTFoMS issued a statement despite Andanar having the sole authority to issue such. TP: Saan po bang part ng Administrative Order 1 nag-a-allow ng exceptions to the rule (na si Sec. Martin lang ang puwedeng mag-issue ng mga statements? You see, mainstream media has been screaming, “Rule of Law! Rule of Law!” for the past year, and this is what the Rule of Law dictates. So gusto ko lang po… kailangan ko lang ang enabling law which allows that body to bypass AO 1, to bypass the orders of the President. Egco: We did not actually bypass SMMA (Andanar)… Of course, andoon ang chair, andoon ang lahat, everybody there, making the policy kasi e… kumbaga, kung ako masusunod, RJ, of course, ayokong mag-release ng kung anu-ano. TP: So bakit niyo ni-release? Egco: Iyon kasi ang decision ng body. TP: Sabihin na natin na powerless kayo sa decision (ng PTFoMS as a whole)… If were to sue someone for violating the Revised Penal Code, should I be suing you, or should I be suing them? Egco: E I think it’s the decision of the Task Force kasi… Ganito kasi, pag nakita mo yung mga statements ko before, may reference yon if it was my own statement, na ipapaalam ko kay Secretary.TP: Ang issue ko dito, did we follow the law in the issuance of this statement? Kasi we can argue all day about what’s ethical and what’s not e kaya lang, magde-deadlock lang tayo don. So the question boils down to who violated what (law). TP: O sige sir, I think I’ve heard your side and I’ll take your word for what it is, and I’ll just do what I can do from my end. Kasi sir, social media publishers are not very happy with what he task force did. So.. ehh.. ganun talaga. TP: Naku sir, e kumonsulta ka muna kay Sec. Martin… magtu-two counts ka ng (Usurpation of Authority). TP: E totoo di ba? Magtu-two counts ka. I would like to request for any document issued after the October 2016 issuance of Administrative Order No. 1 that effectively amends AO 1 Sec. 5, or the clause that reserves solely to the PCOO Secretary the authority to issue non-administrative public statements on behalf of the Presidential Task Force on Media Security (PTFoMS). I would like to know if there are any subsequently-issued law or regulation that enables anyone other than the PCOO Sec. to serve as PTFoMS spokesperson or to execute all or part of the PTFoMS spokesperson's responsibilities as detailed in AO 1 Sec 5. Before I cite potential violations of existing laws, let me state for the record that Egco’s ignorance of Administrative Order No. 1, the exact same document that created his position, is alarming. Should we entrust media security to someone who does not have a clear understanding of what his Executive Director position entails, of what he can and cannot do? President Duterte, please rethink this particular appointment. Now, let’s move on to the legal issues. I consulted with my lawyer-friends to analyze the situation, and this is what we have come up with, so far. Note that his is not an exhaustive list of possible violations, but a mere preview of what may happen should anyone pursue legal remedies. Also note that I have lodged an FoI request for the resolutions issued during the meetings related to the controversial TPFoMS press statement. I also requested for the attendance during those meetings and if possible, the minutes of the meeting that are relevant to the issue at hand [eFoI]. The hastily issued PTFoMS’ press statement, in consideration of the surrounding circumstances and the mention of my name in the NUJP complaint from which it was based, is clearly a violation of my constitutional right to due process, a right that every veteran journalist, like Usec and former National Press Club president Egco, should be totally aware of. As PTFoMS’ executive director, Egco’s tasks include ensuring that all applicable laws, rules, and regulations are followed in everything that PTFoMS does, and that includes ensuring that I, along with all the social media users referred to by the NUJP complaint, be given the benefit of due process. Egco willfully neglected to even attempt to conduct an investigation into the complaint. Egco willfully decided not to raise this issue during the PTFoMS meeting and thus allowed the PTFoMS to issue a blanket indictment of social media users for an accusation with no supporting evidence. Egco did not even bother to contact me – or anyone else in Social Media – for the other side of the issue, effectively abridging our right to Free Speech. This amounts to the administrative violation of Grave Abuse of Discretion [BatasNatin] that may be considered grounds for his dismissal from his government position. The issuance of the illegal press statement is meant as an attempt not only to intimidate me and other social media users, but also to cause injury to my reputation when Egco, as the Executive Director of the PTFoMS, demonstrated manifest partiality in favor of the Big Media complainants. Because social media publishers, by all means, are also media workers. Thus, it is within the PTFoMS’ mandate to protect social media publishers like me, just like how it protects mainstream journalists. Despite this, Egco decided to side with Big Media, to the detriment of social media publishers like ThinkingPinoy. I am an independent blogger. But just like mainstream journalists from Big Media, my success relies heavily on the goodwill of people, i.e. my reputation. Unfortunately, the complainant NUJP, along with Big Media in general, possibly out of insecurity arising from its dwindling influence, has been attacking the reputation of independent publishers like me, as evidenced by NUJP’s injudicious and capricious use of the term “fake news” to refer to the work of independent publishers. Thus, a rift exists between Big Media, where NUJP belongs, and Independent Media, where I and many other social media publishers identify with. And in this case, Egco demonstrated manifest partiality in favor of the former. The illegally-issued PTFoMS, in consideration of the surrounding circumstances, caused injury to my reputation. i.e. injury to property, as it has been argued that by legal scholars that reputation may be considered property in virtual economies [Blocher 2009]. Relevant clauses of RA 3019 provides the penalty of imprisonment for 6-15 years and perpetual disqualification from public office for this violation. Administrative Order No. 1, Section 5, categorically states that PCOO Secretary Martin Andanar has the sole power to issue PTFoMS statements that are not administrative in nature. Despite this, Egco effectively authorized the issuance of a non-administrative June 22 press release, thereby usurping the authority vested to Sec. Andanar and Sec. Andanar alone. In light of AO 1, the illegally issued press statement, which bears no signatures, shall be construed by the public as a document whose legitimacy emanates from the person authorized to issue it, i.e. Secretary Andanar. But we all know Andanar had nothing to do with the said document. That is, Egco allowed the issuance of the press statement, a statement that per AO 1 gives the impression that it was Andanar who issued it, despite the fact that the latter did not. Art. 177. Usurpation of authority or official functions. — Any person who shall… under pretense of official position, shall perform any act pertaining to any… public officer of the Philippine Government… without being lawfully entitled to do so, shall suffer the penalty of prision correccional in its minimum and medium periods. Moreover and despite multiple reminders, Egco admitted to having issued another PTFoMS press release after the one in question, thus constituting a second violation (second count) of the abovementioned law. The problem in Egco’s defense is that, with or without Andanar’s permission, he still has no authority to issue non-administrative statements. There is no enabling law that allows him to do so. Thus, Egco may have been violated RPC Art 177 multiple times even before this brouhaha happened. In line with this, I have lodged a Freedom of Information request for the list of all public statements issued by Usec. Egco since he took office in October 2016, where the list should identify which of the statements are administrative in nature, and which are not [eFoI]. This entire hullabaloo is a direct affront to my security as a social media publisher, something that falls totally within the mandate of Egco’s Presidential Task Force on Media Security. That is, aside from lodging administrative and criminal complaints, President Duterte’s Administrative Order No. 1 also entitles me not only to protection from the Task Force on Media Security, but also to lodging a complaint to the Task Force itself. Hindi ba nakakatawa na ang complaint kong ila-lodge sa Task Force ay laban sa Task Force? Daddy D, tanggalin mo na ‘yan diyan. Mas maraming mas kwalipikado -- at mas may loyalty -- kaysa kay Usec. Egco. Kung ang simpleng pagbabasa lang, pag intindi at pakikipagusap sa lahat ng involved ay hindi niya magawa. Kailangan siya palitan at managot sa mga paglabag niya. So, USec. Egco, are my writings accurate, or should I issue a clarificatory statement just like you did?